There are actually quite a few ways that cats can get white marks. These can range from small spots to cats with all white hairs, not all of which are controlled by the same genes. If your cat has small white regions on the chest or stomach, then it has ‘lockets’ or ‘buttons’. These are controlled by one or more genes that are not well understood nor part of the gene map. You can note it on the chart if you like. If this is all the white your cat has, proceed to ‘Cats with no White’ below. A light, nearly white chin and rings about the eyes are part of the tabby pattern and not true white spots or regions. From small white regions we turn to all white cats. And I do mean ALL. A single non-white hair after kittenhood on the cat disqualifies it from having the dominant ‘W’ version of this gene. The effect is to block the placing of any pigment on a hair, leaving it white. There are actually two other genes that also do this. If the cat’s eyes are not blue or pink, then it is almost certainly Dominant White. (It could also be a 100 percent White Spotted cat, but this is rare). If the eyes are blue, it still is more likely to be Dominant White! A rare Albino gene can produce a blue-eyed white cat. It is far more uncommon than the other two ways to produce such a cat – Dominant White and White Spotting. Perhaps the only way to be confident of the presence of this gene is if you knew neither parent cat was all white or had any white spotting. Another Albino gene can produce a white cat with the familiar pink eyes. This is extremely rare in cats. The White Spotting gene is responsible for most of the white on ‘cats with white’. If active, the cat will have some white. This gene has a variable expression, so the amount of white can vary from a little on the paws to covering the entire cat with white. If the white extends to the eyes, one or both can be blue. If it extends to the ears, the cat will often, but not always be deaf. Having the blue eyes is an indicator of deafness, but a blue-eyed white cat may not be deaf. The amount of white produced is determined by polygenes. 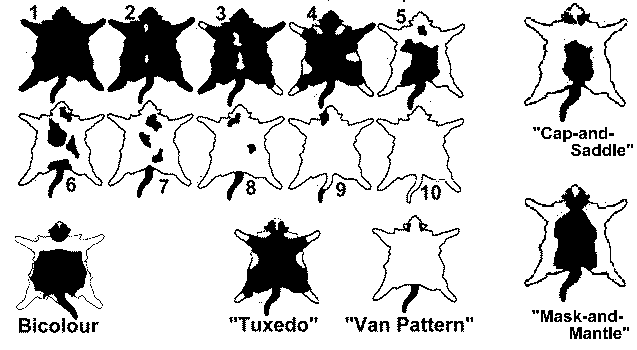 The various levels of white are numbered, and some common patterns have been given names: ‘Van’ and ‘Tuxedo’ are examples of this. In general, low levels of spotting produce white on the feet and stomach first, then along the belly and up the chest and face, and finally approaching the back and top of the head and tail. You can use the above chart to put a name or number to your cat’s level of spotting. While ‘no white’ and ‘all white’ are possible, levels near the center are more common. If your cat has no significant white parts, aside from the ones mentioned above, you can fill in several genes to show that they are not actively producing white. The pointing effect is due to a mutation on the Albino locus that makes the depositing of pigment on hairs of the cat temperature dependent. Cooler areas are less affected which is why the ‘points’ of the cat are darker than the bulk of the body. There are two similar mutations that produce this effect, the ‘Pointing’ gene (c[s]) which produces ‘Siamese’ type high contrast pointing and blue eyes and the ‘Sepia’ gene (c[b]) which produces a much lower contrast effect – the body is much closer to the points in color. Burmese cats have this kind of pointing. These two pointing genes are “incompletely dominant” with each other – if a cat has a mix of the two genes (c[s]/c[b]) the resulting pointing effect is a mix of the other two effects and the eye shade is different from cats having two of either gene. Tonkinese cats have this mix, which can never breed true. Two parents will have a mix of Pointed, Sepia, and Mink kittens, the latter being the name given to the Tonkinese shading pattern. When later trying to determine the genetic color of a pointed cat, assume the darkest color is lighter than the true genetic color. So a ‘brown’ Seal Point Siamese should be considered black, not ‘chocolate’. This page gives some examples of the differences in the three shadings. It is from a Tonkinese breed site. They call “Sepia” pointing “Solid”. The four colors they display are regular and dilute versions of the most common two variants of the black gene. The eye color also gives an indication of the shading type. Pointed cats will have rich blue eyes, Mink cat will have ‘aqua’ eyes, and Sepia cats will have green or yellow eyes. There are three different types of tabby patterns. They are more or less identical on the head and legs – pale chin, stripes out from the eyes, the ‘M’ on the forehead, and parallel horizontal striping on the legs and feet. If your tabby has black or grey stripes, use the link in this section. For Orange tabbies, take a look at the pictures to determine the tabby type before moving on to the orange tabby section. The ticked tabby has striping on the face, and legs, but the body is virtually all agouti hairs. 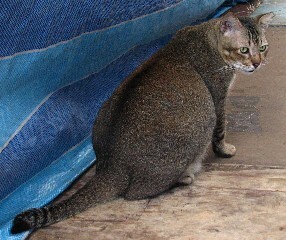 Pointed cat breeds often use this pattern to limit ghost striping on the body. This pattern is dominant. Its symbol is T[a]. The most common tabby pattern, the body has vertical stripes along the body. Its symbol is T. It is dominant to the Classic Tabby pattern. 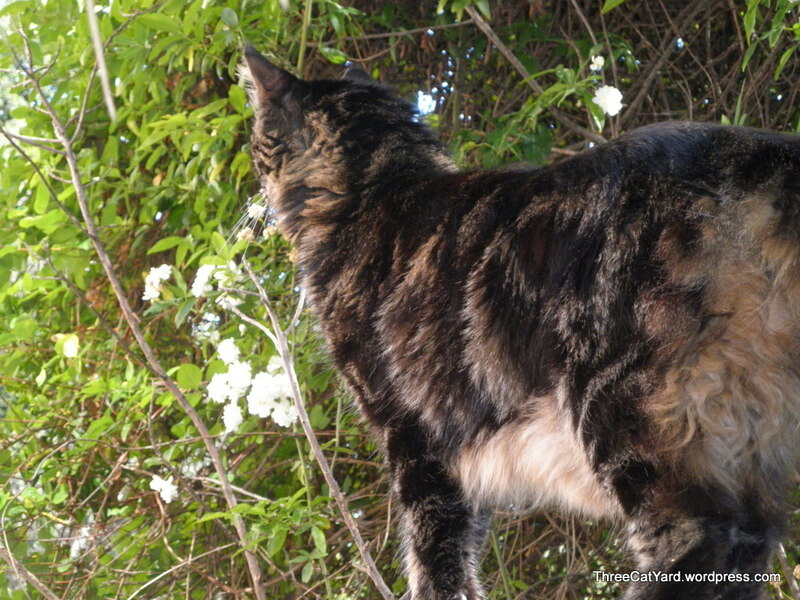 The Classic Tabby pattern has bold swirls on the side of the body. The head and legs are like the other patterns. The symbol is T[b]. Solid cats are caused by the Agouti gene having two recessive ‘non-Agouti’ variants (‘a’). This overlays solid color over the agouti hairs, giving a uniform shade. Orange tabbies are more complicated because you can’t use the lack of stripes to determine the state of the Agouti gene. I believe you can use the other tabby characteristics to help, however. The tabby pattern also gives the cat a light chin and light rings around the eyes. If your orange cat has these, then the Agouti gene has at least one ‘A’ gene. Note: I have read that in some cases you can have a non-agouti Orange Tabby with a white chin. Since it seems to be uncommon, the above rule seems better than nothing. If your cat has dominant white, almost every other character is hidden. You would only be able to determine any possibilities by checking parents or kittens. And likely not much even if you did, since most of their characteristics will be hidden too. Almost the only way to know you have this is if you know the parents were not white or white spotted cats. If your cat shows any level of white spotting it must have at least one ‘S’ gene at the White Spotting locus. It is thought that having two such genes improves the odds of having large amounts of white, so a mostly white cat might well have S/S instead of S/s. However, this is not a sure thing. White Spotting S/- Level ? Note: if your cat is a pointed cat, the Albino locus may be changed later. Note: if this Locus was already filled in by another table, do not change it. Additionally, you know that the other Tabby gene cannot be T[a].